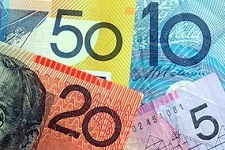 $157 bn of that is extra revenue to be gained from Labor’s policies on negative gearing of investment homes, the gift cheque of franking credits, largely to well-off or rich retirees who receive no full of part pension and pay no tax, the 2% tax temporary surcharge on the top marginal rate as a deficit reduction measure. The good news, if you want to call it that, is that these measures, costed by Treasury without Treasury being told they were Labor promises, are only $157 bn over 10 years and not $200 bn as the Coalition have been saying for yonks. The remaining $230 bn relates to the Coalition promise to flatten the mid-range tax scales so that incomes of $45,000 to $200,000 will all be taxed at a marginal rate of 30c in the dollar, which Labor rejects. Shadow treasurer Chris Bowen says the economy won’t be able to afford these tax cuts. He’s probably right. We haven’t had Labor’s last word on budget plans yet, but I think they will be quicker into a surplus of 1% of GDP, which the Coalition projections never reach. 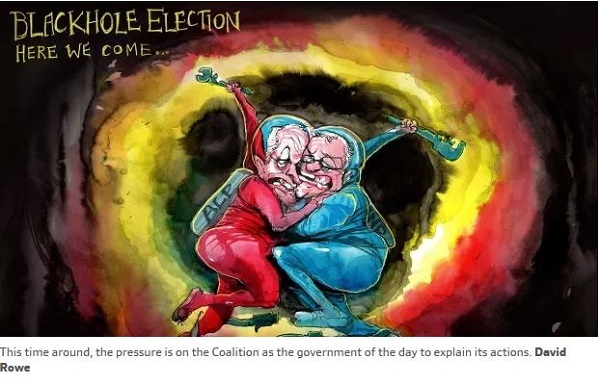 Their surpluses are razor thin, and based on such shaky premises about the performance of the economy that they will probably dissolve into the mists, as Wayne Swan found when Treasury/Finance forecasts consistently proved wrong. Peter Costello says we should take no notice of what is promised in the term after the term after next. He’s right, it’s fairy-tale stuff. From this we can see that the Whitlam government expanded the public sector by at lead a third, possibly by 40%. It looks as though Keating tried to push that out by around a further 10%, but had to retreat. 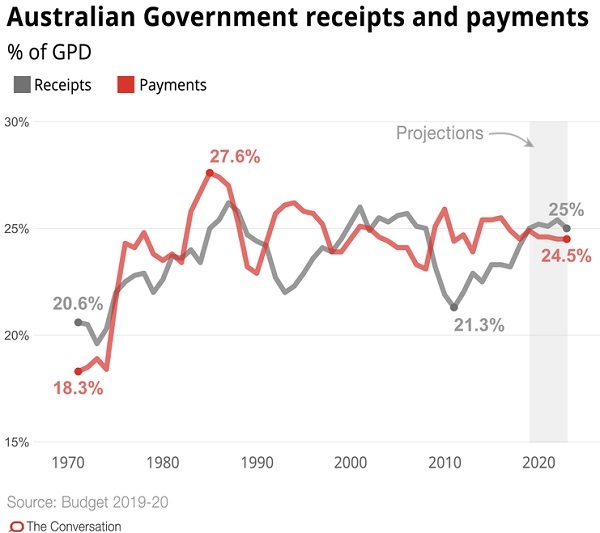 The Coalition has imposed an arbitrary tax to GDP ratio cap of 23.9%, which The Australia Institute says this will force austerity cuts to existing programs in order to fund new programs. Arguably, this is already happening. Labor plans to extend the tax to GDP ratio to 25.9%, which is really fiddling around the edges and still leaves us a low-tax country in the OECD. PM Scott Morrison is telling us that Labor’s tax grab will leave you on average $5400 worse off (not sure whether that is individuals or families, over one year or 10, it matters little). Bill Shorten is coming after “your money”. This is untrue, unless you are one of the privileged. The rich pay most of the tax, and most people under Labor will pay less. 2. What is wrong with politics? “well we might be doing it, but they did it first and/or worse”; or “I won’t be lectured to by them when they did something else completely irrelevant but which sounds equally bad”. Peter Dutton is the champion at the latter. the major parties – the Coalition, in all its manifestations, and Labor – managed to win just 73 per cent of the total vote. And the informal vote – the ultimate “up yours” to all politicians – was 720,915, or just over 5 per cent of the total vote. “not only is it detrimental to good government and the national interest that politics has become an opportunistic, short-term game of point-scoring and blame-shifting, indulgent, and mostly negative, but our political masters now seem to have lost their moral compass”. I would point out that according to Essential Report, major party polling is pretty much the same as it was in 2016. Tingle, however, is hoping that this time the rate of voter desertion becomes unignorable so that pollie behaviour changes. Wouldn’t that be nice? Their first program of the series, Elections and economics with guest Nicholas Gruen, CEO of Lateral Economics, was quite illuminating. Gruen says that politics in general, and elections, were part of the ‘principal agent’ problem. The government may be the body most able to influence a certain matter, but on many important issues it really does not have control. This leads to false expectations, false promises, and false success claims if something turns out well. Beyond that there is a problem with the media, because their principal role is to make money. Even the ABC is concerned about ratings, looking for eyeballs. This leads the media to emphasise narratives and stories, rather than the rational consideration of policies and plans. It also reduces the politics to advertising, with an emphasis on the quick snappy grab. He cites figures that in the US between 1968 and 1988 statement from the President had reduced from 48 seconds on average to just 8 seconds. Like advertising, politics and campaigning now used the technology of human manipulation not persuasion. The aim was to misrepresent the policies and motives of your opponent, and then to manipulate the public response to that manipulation. Gruen did not say so, but clearly that is what we are getting in spades from ScoMo and his mob. Gruen’s answer to this was to set up ‘citizens chambers’ – 237 people selected to represent the population. 237 because there are 237 federal politicians. They would be seconded for a year, given secretarial and research support to consider issues important to the future. The issue he used was Tony Abbott’s decision to cancel the carbon tax, which he says costs the public purse $11 bn pa directly, leaving aside implications for the planet. He uses the analogy of a jury in our form of law, so he is looking for strong consensus, citing that in various Australian jurisdictions agreement by 10, 11 or 12 out of 12 is required. Gruen sees the citizens chamber as additional to, rather than replacing representative democracy, if I’ve got him right. He says citizens chambers are being trialled in Belgium and Madrid. He says we don’t need to wait for the pollies, we can look for benefactor funding. Labor and the Coalition are not serious about climate change. Wrong, Labor is. Labor has no plans for developing hydrogen as a green fuel. Wrong, it’s an explicit component of Labor’s platform. Labor has no plans to increase NewStart. Labor has said many times that NewStart is too low, but want an inquiry first. That’s what Kristina Keneally, who is accompanying Bill Shorten to brighten up his campaign, said about Peter Dutton. Here’s how the matter progressed. First Peter Dutton Reckons His Labor Opponent Is Using Her Disability “As An Excuse” for not living in the electorate. There more at The New Daily and just about every media outlet. 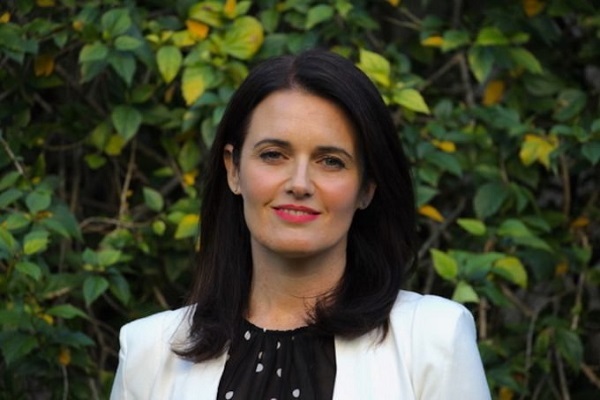 The response from his Labor opponent Ali France was ‘Disability is not an excuse, it is a reality’: Labor candidate hits back at Dutton. She lost her leg in a car accident in 2011, lives a few minutes outside the electorate, but has had trouble finding a place with appropriate disability access. At first Dutton doubled down, saying he was just repeating comments made in his electorate. ScoMo supported him. The he apologised, but only on Twitter. So far it has been too much to expect a personal apology. Weekend Salon 14/4 : Election edition now up. I’ll try to do a more general edition tonight, as there are a few things I don’t want to let slide by. (c) that Labor extra spending is actually at the margin, and will not transform the public sector in Australia. It might add a bit of decency and stop certain sectors from being squeezed to death. Doug, I don’t think we know just where to pitch NewStart. We could benefit from looking at some European models which seek to maintain lifestyle. But then I’m not a full bottle on NewStart. There is an argument to give an interim lift while the inquiry is proceeding. What di Natale said about hydrogen was simply wrong. Labor is serous about climate change, but not serious enough. It’s simply misleading to put then in the same category as the Coalition. Di Natale knows what he’s doing. He’s playing politics and does it quite consistently. If you have perceived I’m p*ssed, you are right. Not angry, just what I said. Full ALP pom-pom mode atm I see. I recon you’ll still preference greens 2nd Brian so much of a muchness really. Brian: I think a vote for the Greens sends a stronger message on climate change than voting Labor. What Di Natalie is saying is a lot closer tot the war footing you and I keep talking about. But John, if Dr di Natale says the ALP has no policy on H2 and they actually do have a policy on H2, isn’t that a downright Fib?? There are some voters, I think, who would mark his Party down on the basis of that Fib, whatever the Party’s other policies might be. Just as there are a few who will now not vote Liberal solely because of the Electric Vehicle Scare. Yeah, alright, I’ll go for Gruen’s Citizens’ Chambers – but at least 600~700 members, please. Firstly. the urban myth persists that we are “over-governed” whereas the reality is that we are very short of political representatives of our needs and interests. 237 is far too few; they are spread far too thinly to be effective as it is, so having only 237 would be merely a name-change and be very little improvement. Secondly, far too much of our political representatives’ time is squandered sorting out relatively minor matters that should have been attended to by ombudsmen and by law-enforcers. Having a dozen times as many ombudsmen and law-enforcers as well as having an adequately filled Citizens’ Chamber would deliver us good government for a change. Gruen is right in saying, “The government may be the body most able to influence a certain matter, but on many important issues it really does not have control.” but, after generations of politicians and their hangers-on gradually surrendering one tiny bit of government authority after another, how the blazes would we and our representatives be able to claw back even a part of what has been surrendered? The government, eventually, influence by gunpoint. Every government is pro gun for them. Ambi: Brian is right. both the Greens and Labor have hydrogen policies which I assume are based on the relatively new idea of shipping liquefied renewable hydrogen to places like Korea that don’t have the room/weather to produce enough renewable energy for their needs without going nuclear. I only got interested in the idea a hydrogen economy when i realized that liquid hydrogen could be shipped at something close to atmospheric pressure using similar technology to that used for shipping LNG. Gaseous hydrogen is liquefied by cooling it to below −253°C (−423°F). Once hydrogen is liquefied it can be stored at the liquefaction plant in large insulated tanks. It takes energy to liquefy hydrogen—using today’s technology, liquefaction consumes more than 30% of the energy content of the hydrogen and is expensive. From memory, LNG liquification consumes about 25% of the contained energy. Jumpy, just so you know, I have been at times annoyed enough with the Greens to put them below the Liberals. It depends somewhat on the quality of the candidates on offer. Ambi a fib is a fib. Di Natale is doing exactly what Nicholas Gruen was saying is buggering up politics. Not as bad as ScoMo and his mob, but still doing it. Repeatedly Bill Shorten has said he wants to talk about his policies, not comment on the opposition. But the common wisdom is that negativity works, and one of the problems some in the COALition had with Malcolm T is that he was not negative enough. Graham, well spotted that the Citizen’s Chamber is not big enough to be representative. Also there is an obvious problem as to who selects them and how, plus the limitations of appropriate people not being able to take time out of their lives. It’s probably still worth a look at what they are doing in Belgium and Madrid though. The brief mention I saw a couple of weeks ago said Labor wanted to encourage a H2 production industry in Qld, to be powered by solar energy and to export liquid H2. An Adani/ coal substitution as I recall. But I haven’t read either policy. While it should not be assumed that a Labor Party will always have the best policies for “labouring persons”, it also can’t be assumed that a self-styled Greens Party will always have the “greenest” policies, in my view. Let’s analyse each policy on its merits, according to our preferred outcomes, the policy’s costings, its social effects, etc. BTW, so-called “product differentiation” doesn’t necessitate fibbing. A Party can be distinctive by its emphases. And if a Party avoids fibbing, that alone will confer distinctiveness. I ‘d prefer not to get down into that gutter where “their fibs are worse than my fibs” is played by politicians. Do elections have to bring such muck up to the surface? I fixed your comment, Ambi. Jumpy: Brian has revealed aspects of his voting history to you and we expect you to reciprocate in a similar manner, particularly since you’re such a quid pro quo type of person. zoot, I can’t because I can’t actually remember. I do remember that 11 times I had the opportunity of voting for Drew Hutton, a Greens candidate from time to time for three levels of government, and in recent years achieved fame for his anti coal seam gas Lock the Gate activities. Not once did I vote for him or preference him in a favourable way. He’s not all that bad a bloke, and had the misfortune of being a fine athlete and coached by Alan Jones when he was at school, but I didn’t think he’d be a good politician. (which is neither Muslim nor Middle Eastern, though it had a history of welcoming reffos and migrants). ON voters seem to have become annoyed at the NRA shenanigans, even though they were reported by the ABC and Al Jazeera. They have peeled away in large numbers. The ON voters are “disillusioned, not rusted on” as the cliches go…. but this time they seem to be disillusioned with a minor Party. Time to park that cliche about “disillusion = higher vote for minor Parties” trope?? Brian @ 9:49 am – You’ve just shown Jumpy to be wrong again. Will he apologise for making snide comments that cast aspersions (which is against the comments policy)? To your first comment, I didn’t ask about Brian’s voting history, you made that up. And to your second, it was a forecast, not an “ aspersion “. You made that up too. Hang on, unless you think preferencing greens is a bad and shameful thing, do you ? You know what, cancel that question, I don’t really care. I don’t think so, they may just go with another minor Party. But we shall see in a few short weeks. Jumpy – I didn’t say you did. You made that up. Ambigulous: Way up it this Dependancy, Colony, Mandated Territory and Occupied Zone of the Brisbane Empire, it would seem you are right about One Nation preferencers being cheesed-off at the ON-NRA shenanegans – but it goes deeper than that, there is a deepseated loathing of the U.S. National Rifle Association by some fair-dinkum Aussie firearms users, that loathing seems to go all the way from the worshipping of guns, through the blatantly immoral manufacturers right through to the tolerance of school shootings. It’s a wonder they haven’t ditched their Made In US firearms in favour of those made in Finland, Italy, Brazil, etc. Confounded Aussie firearms users: they wilfully refuse to comply to the stereotype so carefully constructed for them. I don’t think a lot of voters who intended voting for One Nation will drift to Labor, The Greens or (in Queensland) LNP. Clive Palmer has pressed all the correct buttons that should lead to a landslide win – but he has the albatross of the Yabulu nickel refinery workers’ wages around his neck. Katter Australia has such a low profile these days. So who will get the votes of disaffected ON supporters? I can’t even take a wild guess. Republicans? Communists? Falangists? Lula? Maryjooana Party? United British Empire Loyalists? Berlesconi’s Bongo-Bongo Party? Peronists? Just so long as they don’t give a landslide victory to Informal. Haha, just did another Ucomm phone survey. But pretty sure this inner metropolitan, 18-34 yo, Uni educated Gal didn’t give em the answer they were heavily steering me toward. I recon I’m now on a “ always participates “ list. If some ON voters have now become former ON voters they might move to another minor Party, and Graham has listed a wide range of possibilities. I had thought the venerable Clive was put out to pasture now. Not so? ? The Peronists were wrecked by that musical about Argentina. Interesting if the ON exiles drift back to Labor and LNP. But almost impossible to tell unless you asked them all. From my anecdotal evidence among the filthy Tradies there’s some support for Palmer. I’m putting it down to the barrage of jingoistic adds saying what they want to hear + not being engaged in politics or having every read policies of anyone + not having ever looked into his record in political record at all. I do my best to address those issues at smoko when asked. Unfortunately for Clive, half of them aren’t on the roll and a heap that are don’t bother voting anyway. Sorry I massacred that last comment, eating dinner and interrupted by 2 phone calls. Against jingoism are we, Jumpy? BTW one of the worst cases of (almost achieved) foreign interference in Australian elections was the attempt by E.G. Whitlam and Bill Hartley to obtain half a million $ from the Iraqi Baath Party during the 1975 election campaign. When revealed it should have cost Gough the leadership. I’m going with the majority of them being so. Best to bring them back to serving us instead of controlling us I think. I mean, who in there right mind would choose to live in a dictatorship if they had the choice. See yourself as a turd-herder Jumpy? April 14, 2019 at 9:10 pm). Selection to a Citizens’ Chamber could be done as giant raffle using the electoral roll. Why not? It would certainly give us a broad spectrum of Australian society – and, given the dismal failure of the current lawyers-and-staffers closed monastery, would we be any worse off? However, a more acceptable solution would be to have around 500 geographically specific electorates, (slightly easier to operate) and around 200 in nationwide special electorates, with the voters having to select one candidate from each list. Nationwide special electorates might include a dozen lawyers, (no sense in banning all of them), a few dozen scientists, technicians and engineers, a few dozen grandmothers, at least 50 Aborigines in addition to those standing in geographical electorates, and so on. The Speaker would need several non-party Whips and quite a few more staff to keep the show on the road. Regulations and procedures would have to be completely reformed too – but we can do it. “Hardly a challenge, Sir”. It would work. Graham, I guess these ideas are floating around. I’d tend to go back to some of John D’s ideas, discussed previously on this site, for example 3-member electorates, which would tend to break up the two-party system and would more likely give citizens a representative with a similar ideology. New general salon now up. GB: I have been to lots of “important meetings” where people who don’t normally go to this type of meeting get carried away with the importance of the meeting and the importance of those who just happen to be at the meeting. I would be surprised if the arrangement you are talking about doesn’t end up with the same problem. As for engineers as leaders Qld tried that with Campbell Newman as premier. Problem was he was a civil engineer and saw the answer to everything as yet another big civil eng project. Would have been better to have had a process eng like me. Process engineers are more likely to have spent time getting things running properly without having much money to spend. Your first comments there, John, brought PM Rudd’s 20 20 Summit to mind. Interesting to note ABCs promise tracker was born when Abbot was elected and died when he was rolled by Turncoat. And Gillard did have both Houses in coalition with the green, Wilke and Oakshot. Until the bribed Slipper and broke their promises on gambling reforms. Interesting to note ABCs promise tracker was still in operation for this years NSW election. Let’s hope they have enough funding to cover the Federal election. Ross Gittins has words of wisdom, as usual. John D.: Wash out your mouth with soap! How dare you utter the name of that failed politician. Thank goodness I’ve had the honour of meeting many fine engineers who were socially and politically aware, so one political dud doesn’t disgrace a whole profession. Yes, there is always a possibility of some people being overwhelmed by supposed importance and being overawed by authority-figures. Good, impartial and non-bullying preparatory training before the first session of a Citizens’ Chamber would do much to prevent such overwhelming and overawing. Besides, the other side of the coin is people who are given the opportunity to speak their mind are only too pleased to do so – and so call utter b/s by its right name. Yeah, I like your multi-member electorates (though my preference is for 4 rather than 3). Brian: anything that would break up the lawyer-dominated two-party system (or racket) would suit me just fine. b.t.w. my day-long tardiness in responding came from a simple technical glitch – ah, the joys of living in The Other Australia. More members per electorate increases the chances of minor parties having a say but larger electorates may reduce the contact between parliamentarians and the masses. I have no strong feelings in this area. I’ve been working on an election roundup. There’s material everywhere and I have a bit to go. Tomorrow I’ve signed up to a clan meeting in the park, when, by order, it will stop raining.